Seven National Register Historic Districts make up what is known as downtown and midtown Mobile, which means that you'll delight in getting to know these seven distinct personalities spread throughout the Mobile area - they truly define the heart and soul of ‘old Mobile'. There are also several other historic areas that while maybe not nationally designated, are equally as imortant, charming and part of the Mobile story. Get out and explore! Strolling or driving through one of our eight National Register Historic Districts, you'll discover front porches as stylish as the living rooms within, giant ferns swaying in the breezes and ancient live oak trees and magnolia trees forming canopies over many streets. Mobilians are active (they have to be, with all the delicious food around) so you'll likely encounter runners, folks walking their dogs or families riding their bikes. Everyone comes ready with a smile and a wave and soon, you'll feel like you fit right in. You may happen upon one of many street parties held throughout the year, with white linen tablecloths, lanterns swinging from branches, live music or even locally owned food trucks. Picnics and lawn parties pop up during 5k races and marathons with routes that wind through the historic neighborhoods or you may encounter themed bike-rides (Tweed, zombies and home-brewed beer, to name a few), community gardens and library nooks (where neighbors can drop off or borrow shared books for free). Each district has a unique character that relflects the city&apos;s growth during the 19th and 20th centuries. 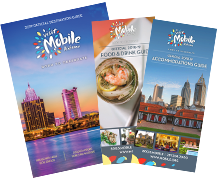 The Mobile Historic Development Commission is a great place to begin planning your journey through Mobile&apos;s colorful architectural history. Be sure to request a driving tour brochure! Find your favorite! While Midtown Mobile is a significant and beautiful historic area and Africatown is an important part of the area&apos;s African American story - neither have been officially designated as a &apos;National Register Historic District&apos; as of yet. Another excursion not to miss is the Spring Hill Historic Driving Tour. Sixteen historic homes and buildings are featured on the tour. A great place to begin is the Stewartfield House, located on the campus of Spring Hill College with its captivating Avenue of the Oaks. Complimentary driving maps are provided by Holiday, Inc. - a proud supporter of the Spring Hill community.